In “Deadtectives,” a group of paranormal investigators, led by Sam (Chris Geere), with their own TV series, also called Deadtectives, go to a woman’s bakery to help her catch a “ghost” that is haunting her establishment. It doesn’t take long to realize that Sam and his crew – friend Javier (José María de Tavira), brother Lloyd (David Newman), and wife Kate (Tina Ivlev) – are a bunch of hacks, resorting to cheap parlor tricks to prove to bakery owner Ethel (Cecelia Antoinette) that they have rid her restaurant of the assumed spectral pest. While Lloyd truly does believe in the paranormal (designing several contraptions reminiscent of objects used in other ghost themed movies – ghost seeing glasses ala William Castle’s “13 Ghosts” and, later, devices similar to the proton packs worn by the “Ghostbusters”), Sam, Javier, and Kate – Kate has grown more than a little uncomfortable with their shtick – do not. Kate reveals her concerns to Sam, hoping to get him to debunk Ethel’s haunting and ease the woman’s nerves. Ignoring Kate’s advice, Sam finishes the case by telling Ethel that her grandmother’s ghost is mad that she stole her recipe and claimed it for her own. Director Tony West sets the goofy, tongue-in-cheek tone of “Deadtectives” from the opening scene. 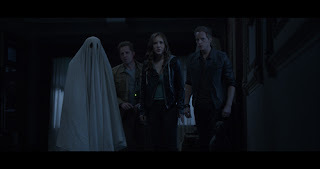 The guys, who do the “ghost” hunting while Kate watches on some monitors with their client, overact for their cameras, attempting to draw in viewers with their hysterics and raise their ratings. Kate seems the sole voice of reason and the only level-headed member of the group. Producer Konrad (Cris Rice) is unhappy with the show, giving the group one more episode to turn things around before being canceled – also informing Sam that his wife plans on leaving the show and moving to another. Konrad forces a new producer, Abril (Martha Higareda), and effects supervisor, the creepy Bob (Mark Riley), onto the show with the intention of upping the scare quotient with more believable effects and tons of blood. He sends the group to Mexico where they are set to investigate a reported haunted house. In the face of cancellation, the Deadtectives find themselves with a new dilemma – ridding a truly haunted house of its ghosts when they have no clue what they are doing. “Deadtectives” script, written by director Tony West and David Clayton Rogers, is a clever one. Haunted house, as well as slasher, tropes are worked in to the movie, played up with a comedic slant. The audience finds themselves in on the joke before the cast discovers the truth. The Deadtectives initially believe that effects master Bob is behind the strange events happening in the house. The ham-fisted acting keeps the viewer from caring about the characters and causes the jokes to feel forced. Even when his character isn’t hamming it up for his show, Geere still plays his character too over-the-top. The other actors find themselves guilty of this as well. Again, Ivlev’s Kate is the most level-headed and believable of the group but her acting isn’t strong enough to carry the film. Most of the comedic moments in “Deadtectives” feel forced, resulting in a movie that never finds it’s footing. “Deadtectives” works as neither a comedy nor a horror movie. It’s not particularly funny and it most definitely isn’t the least bit frightening. It’s a film that could have worked (and, to be honest, might still play well for the late-night crowds). Unfortunately, director West isn’t able to skillfully combine the two genres, resulting in another failed attempt at creating a cult movie.